The courts have defended environmental protections and advanced climate action. They have already played a pivotal role and they will play an even bigger role in the wake of the GOP and the Trump administration's war on the environment and climate action. A number of groups are preparing legal challenges to the Trump administration. As reported by the Hill, Sen. Sheldon Whitehouse (D-R.I.) said, "The heart of the battle is going to be litigation." As explained in the Washington Post, Trump could face the biggest trial of the century over climate change. Here is a summary of rulings related to both climate action and the environmental justice. No one is above the law not even governments and in the era of Trump this becomes more important than ever. In March the Supreme Court effectively limited the president's power to temporarily fill agency vacancies. There have also been legal setbacks to the Trump Administration’s revised travel ban. 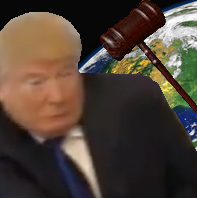 In addition to the nominee selection process and immigration, the courts have also ruled on environmental and climate issues. The courts have proven to be largely supportive of government action on climate change. On June 20th 2011 the Supreme Court upheld the Obama administration's right to use the EPA to defend clean air and act on global warming causing carbon pollution (endangerment finding). Also in 2011 Oregon-based nonprofit called Our Children’s Trust filed legal actions in all 50 states in an effort to force governments to act on climate change. The lawsuits seek to have the atmosphere declared a "public trust" deserving special protection. The same approach was successfully used to clean up polluted rivers and coastlines. Citizens continue to use the courts to try to hold the state responsible for its inaction on climate change. In 2016 the courts ruled that kids could sue the government over climate change. The courts forced Scott Pruitt to release his emails after he was nominated and just before he was confirmed as the chief administrator of the EPA. The courts have upheld the Obama administration argument which says that government has the right to protect American waterways. The courts have also withstood challenges to the EPA's mercury pollution limits. The courts have also ruled in ways that have compromised the interests of environmentalists. Environmental activists have been convicted of breaches against peace and US courts have issued stays against the mercury rule and the Clean Power Plan. They have also ruled against the Clean Water Act. Lawmakers have even moved to pass laws that thwart renewable energy. Last year a group of Republican lawmakers in Wyoming launched a bill that would effectively ban selling wind and solar power in the state. The measure proposes to fine utilities for purchasing energy produced by large-scale renewable power projects. In June 2014 the Supreme Court issued a verdict that could be interpreted as an invitation to polluters. Arguably no single Supreme Court ruling has been more damaging to American politics than the Citizens United ruling. While some companies are litigating against the Trump administration (Facebook, Apple, Google, Netflix, Uber etc), others can expect more lawsuits from environmental groups. As reported by Environmental Leader, in Litigation Forecast 2017, Thomas A. Lorenzen says environmental groups next area of focus will likely be corporate disclosures and climate risk. Companies that are engaged in malfeasance are being pursued by state justice departments. According to Lorenzen, the New York attorney generals office has announced actions against several companies alleging that they knew climate change was a problem but failed to disclose it as required by the securities laws. Judges have ruled against car giants like Volkswagen over their mileage fraud. The courts levied very significant fines against BP after the Gulf of Mexico disaster. Another area that may see more litigation is the EPA's Next Generation Compliance initiative, which requires regulated companies to use advanced pollution detection technologies and electronic reporting. Citizens are emboldened to launch lawsuits with the help of new technologies like infrared cameras attached to smartphones that can capture emissions. As explained in the EL article, "lots of companies can expect this to be a growing part of their litigation docket." The fossil fuel industry can expect a plethora of lawsuits. In March Exxon, now infamous for subverting the facts and withholding climate information, was forced to hand over emails proving that they had scientific evidence of climate change even though they were publicly deriding the science. "Addressing our country’s largest source of carbon pollution — existing fossil fuel-burning power plants — is both required under the Clean Air Act and essential to mitigating climate change’s growing harm to our public health, environments, and economies...We won’t hesitate to protect those we serve — including by aggressively opposing in court President Trump’s actions that ignore both the law and the critical importance of confronting the very real threat of climate change." As the the US Court of Appeals for the District of Columbia prepared to hear arguments for and against the Clean Power Plan in 2016, former Republican EPA chiefs made a legal argument asking the courts to uphold the Clean Power Plan. In a New York Times op-ed, William Ruckleshaus and William Reily, who served under Presidents Nixon and Bush Sr., respectively, argue that older coal-fired power plants that are responsible for at least a third of all human-induced carbon releases, produce more heat-trapping emissions than cars, planes and homes combined. The former administrators have also filed a friend of the court brief in favor of the plan. The state of California is preparing to use the courts to challenge Trump's assaults on climate and the environment. This includes his rejection of the EPA's vehicle fuel economy targets and the clean Power Plan. Other states are also expected to turn to the courts to protect them from Trump and his fossil fuel focused agenda. The Standing Rock Sioux are well known for their resistance to the Dakota Access Pipeline and as reported by Grist they will continue the fight in court by claiming that the construction of the pipeline near its reservation and through sites it considers sacred would violate the tribe’s treaty rights — specifically, its rights under the 1851 and 1868 Fort Laramie treaties. The tribe’s legal motion also charges that the Army Corps violated the National Environmental Policy Act by terminating an environmental review of the pipeline, and violated the Clean Water Act as well. Other tribes are waging other legal battles against the pipeline including the Cheyenne River Sioux who filed a motion to temporarily halt construction on the grounds that the pipeline would violate their right to religious freedom by desecrating the sacred waters of Lake Oahe. The Oglala Sioux Tribe launched its own lawsuit claiming that the pipeline threatened its treaty rights to safe drinking water. Independent of the outcome of these suits these efforts serve as a "template for an indigenous-led movement against projects that pose threats to the environment and to tribes’ sovereignty — a template that could prove crucial to activists over the next four years." We also expect to see similar resistance to the Keystone XL Pipeline, whose resurrection by the Trump administration has already been challenged by the EDF. Legal victories in Denmark, the UK Pakistan and Canada show how the courts can combat climate change. The high court in these countries have defended climate action as an imperative. In 2015 the high court of justice in Lahore ordered the creation of a "climate council" to force the Pakistani state to uphold its environmental commitments. In fact we have seen landmark court decisions in defense of the environment all around the world. Climate justice is a global force to be reckoned with. Bolivia and Ecuador have already given legal rights to the Earth. There is an ongoing push to ratify a declaration of planetary rights at the UN. Global treaties are helpful in the sense that they bind countries to adhere to actions so they are not impacted by a change in government. Even the US under the "leadership" of Trump and the GOP has a legal duty to respect its treaty obligations. The US is bound by law to honor the Copenhagen Accord, that unlike the Paris Agreement was ratified by congress. In response to Trump's Executive Orders green groups filed a sweeping lawsuit accusing him of usurping Congress’s powers to enact laws to protect public health, safety, and the environment. The lawsuit was filed by Public Citizen, the Natural Resources Defense Council, and the Communications Workers of America. The courts have even been used to challenge the federal election results that elected Trump. The argument in a case known as Blumenthal vs. US is premised on what is known as the “Guarantee Clause” in the Constitution. This clause tasks the government with keeping America safe from foreign invaders. The case was brought forward by Diane Blumstein, Nancy Goodman, and Donna Soodalter-Toman. In response to Trump's Executive Orders green groups filed a sweeping lawsuit accusing Trump of usurping Congress’s powers to enact laws to protect public health, safety, and the environment. The lawsuit filed by Public Citizen, the Natural Resources Defense Council, and the Communications Workers of America. On April 3rd, 2017 the United States Supreme Court refused to pause a case challenging an EPA water protections rule. This rule was implemented under President Obama and it regulates businesses and other development plans near small waterways. This is but the latest in a series of Executive Orders that the courts have opted to ignore. Trump has turned stomachs around the world with his ability to say almost anything and get away with it. However, the courts are not as forgiving as his base appears to be. Judges have already used Trump's own words to overrule the Muslim Ban and move forward with a case that accuses him of inciting violence. A similar legal argument could also challenge Trump's assault on climate action and environmental protections. As reviewed in a Bloomberg article, Trump's words may be used as evidence that his directives are driven by politics or that his regulatory disposition has a predetermined objective. This would be grounds for a lawsuit as a violation of the 71-year-old Administrative Procedure Act that governs regulations. Similar legal concerns contributed to the unraveling of his travel ban. There is evidence to suggest that the words of both Trump and Pruitt make them vulnerable to litigation. Trump vowed to repeal carbon rules for power plants to reverse environmental regulation and save jobs. EPA Administrator Scott Pruitt discounted the role of carbon dioxide as the primary driver of climate change. Those comments could give legal ammunition to opponents if the EPA decides to reverse its landmark 2009 endangerment finding. Every administration must provide a good explanation of its regulatory reviews and this must include factual, legal and policy justifications. They can't invoke cost as this was not part of the original statute nor can he ignore the social cost of carbon. Courts also have held that federal decisions can be disqualified if they were driven by regulators who have an "unalterably closed mind" on an issue. This is ironically the same argument used by Pruitt to sue the EPA. Pruitt's attorneys argued that the Obama administration had already determined that it had the authority to issue the Clean Power Plan. A case that incidentally he did not win. The courts may be our best hope of rapidly altering our current untenable trajectory and moving towards a sustainable future. According to lawyer Polly Higgins an amendment to international law could quickly and radically change our perilous global direction. Higgins proposed a new international law, which if implemented, would make damage and destruction of the environment a crime called ecocide. Perhaps most notably the law would preclude fossil fuels and massively support renewable forms of energy. Higgins is looking to advance the green economy through legal dictates that inform government policy and corporate conduct. She wants to see the criminalization of habitat destruction, biodiversity loss, soil depletion, deforestation and the disruption of natural cycles. Under the current system regulatory non-compliance is met with fines, under Higgens proposed law ecocide would be punishable as a crime. Consequently CEOs and other executive could face jail time for breaking such a law. The idea is to provide powerful disincentives for the unethical and immoral pursuit of economic gain. Rather than see the Earth as a commodity Higgens proposes that we move towards "trusteeship law, to encourage guardianship and stewardship of the Earth." To make ecocide a crime against peace, there would need to be an amendment to the Rome Statute, the treaty under which the International Criminal Court can prosecute. "If you view the Earth as a living being, you recognize its intrinsic value and you take individual and collective responsibility. Trusteeship comes with a kick though, because when you impose that responsibility as a legal duty of care it attaches itself to real people," Higgens said. While we may not always agree with the courts, the law remains an essential tool to advance the national interest including environmental protections and action on climate change. Legal processes also encompass impeachment and Flynn's request for immunity may very well signal the end of this administration.